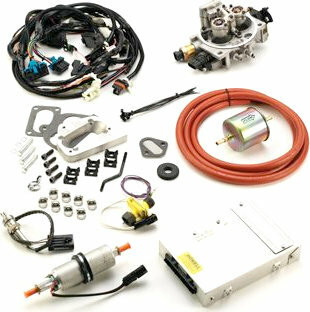 The Howell EFI kit converts 258 Jeep engines to Electronic Fuel Injection by adapting 4.3L GM V-6 components and in-line electric fuel pump. Throttle Body Injection adapts directly to Jeep 2 barrel carb inlet manifold. Most of the old emmission plumbing is eliminated making for a cleaner and easier to maintain engine. Improve your Jeep vehicles drivability and fuel economy while bringing life back into a tired motor by converting to fuel inection today! This kit uses almost entirely GM parts and even includes a diagnostic port for easy trouble shooting at any GM facility. It does not get much easier than this.